Spend Your Long Weekends, Romancing Nature—10 Offbeat Retreats to Revive the Stressed Delhiite! Situated near the legendary Jim Corbett National Park, known for its sightings of the Royal Bengal Tiger and over a 5-hour drive away from Delhi, Aahana provides a serene retreat amidst nature, apt for a wild weekend getaway! This eco-friendly resort provides an adorable cluster of luxurious accommodation in an elemental setting! The wide variety of birds at Aahana makes it a birdwatcher’s paradise! Couples can take a quick dip in the gorgeous outdoor pool, overlooking the lush lawns of the resort. The spacious rooms, decked with traditional wooden furniture, create a warm ambience! Dhikala, the in-house restaurant, offers a delectable multi-cuisine menu! The verdant backdrop and the plush interiors promise a tranquil sojourn, apt for those who wish for some cosy romance in the wilderness! Book Now! Dehradun, the capital of Uttarakhand, located about 6 hours away from Delhi, is a gorgeous hill station that houses stunning caves and breathtaking waterfalls, such as the Sahastradhara and the Tiger Falls! Situated amidst the isolated fringes of this mesmerising locale, Vishranti provides a cosy haven for spiritually inclined, nature-loving couples! Owned by former Indian cricketer, Michael Dalvi, Vishranti provides ornately decked cottages! The wooden planks, the stone walls and the four-poster beds exude a rare vintage feel! The lush premises house exotic birds, while their very own organic farm ensures healthy meals for guests! Replete with an adorable little pool, Vishranti offers a unique spa, nestled beneath a ‘rudraksha’ tree! 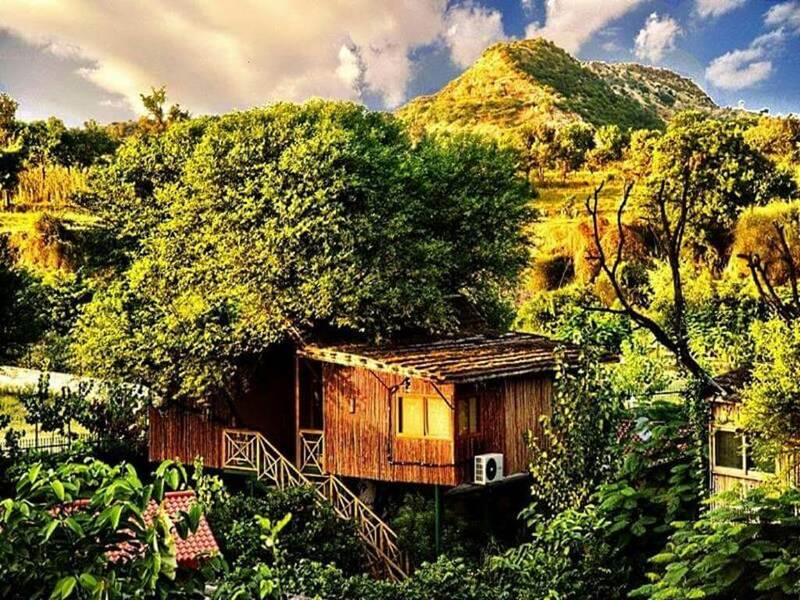 An isolated nook for a serene, romantic weekend! Book Now! 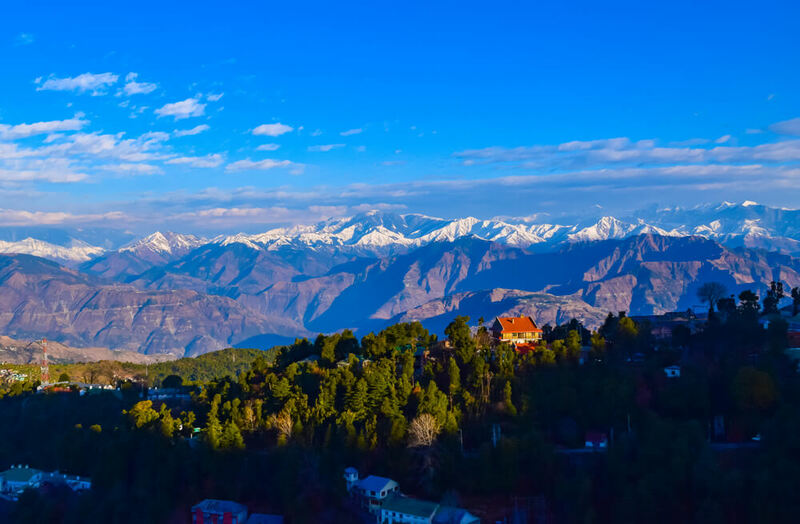 Approximately an 8-hour drive away from Delhi, the stunningly beautiful hamlet of Kanatal, in Uttarakhand, is an isolated site, known exclusively to a niche community of adventure addicts and travellers! Kanatal offers leisurely treks to places such as the Kodia forests, known for its natural springs and wildlife! 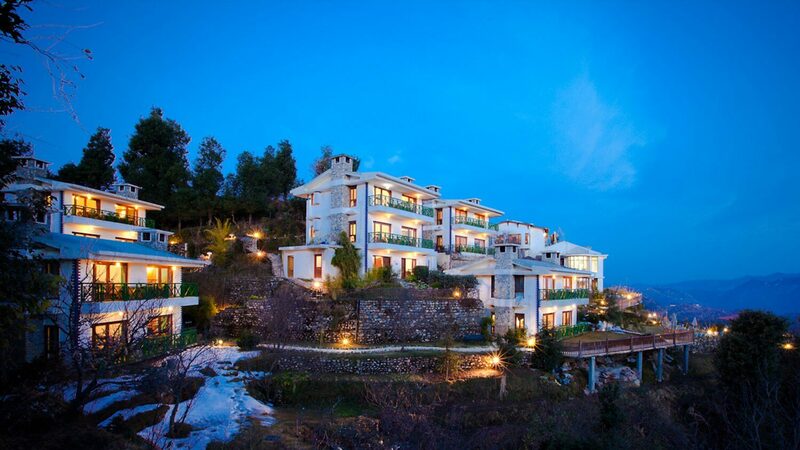 The Terraces is a tranquil luxury retreat, located amidst this alluring landscape, along the Chamba–Mussourie highway. 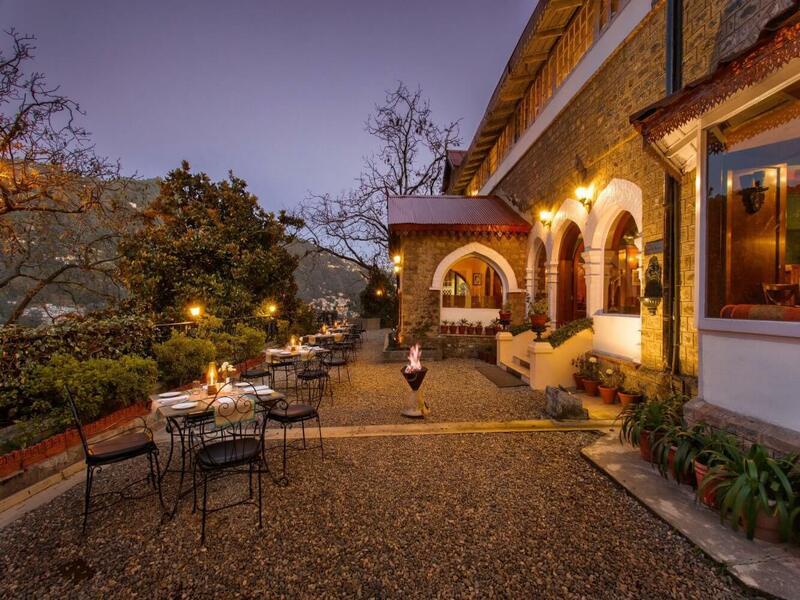 A few kilometres away from the adventure lover’s haven, Dhanaulti, this boutique resort offers a secluded sojourn for weary couples! A romantic open-air dining experience awaits those who check in to this resort! The Terraces Café offers delectable delicacies, on the terrace, overlooking the steel-grey mountains! 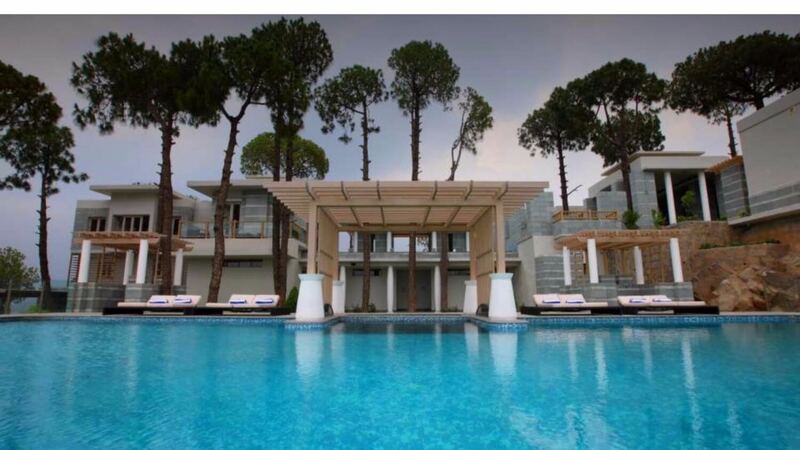 There is a lavish spa, overlooking the magical hills, for luxury lovers! The rooms, some of which are equipped with private balconies and cosy fireplaces, are decked with warm, vibrant colours! An ideal blend of raw Nature and subtle sophistication! Book Now! It takes a 7-hour drive from Delhi to reach Mussourie—a popular Indian summer destination since the British era! This picturesque locale adorns the Himalayan foothills of the Garhwal range in Uttarakhand and offers a serene escape from the humdrum of urban life. Fortune The Savoy is a jewel in the crown of this queen of hills. An ITC venture, this stately Gothic structure is located close to Mall Road. Once the abode of British dignitaries, this grand retreat offers cosy rooms and plush interiors, decked with subtle shades! Old-school romantics will love the warm wooden interiors, decked with chandeliers and antique décor! The cosy ambience at Nostradamus—the Writer’s Bar, a legendary bar that has been patronised by eminent literary stalwarts, is apt for poets and authors! This iconic hotel, said to have inspired the works of authors such as Agatha Christie, is ideal for couples who love basking in old-world charm! Nestled amidst the scenic Himalayan foothills of the Tehri–Garhwal region of Uttarakhand, Rishikesh is an adrenaline junkie’s paradise. A 6-hour drive away from Delhi, this mesmerising location provides the ideal ambience for hair-raising adventure activities, such as river rafting, bungee jumping or waterfall rappelling. 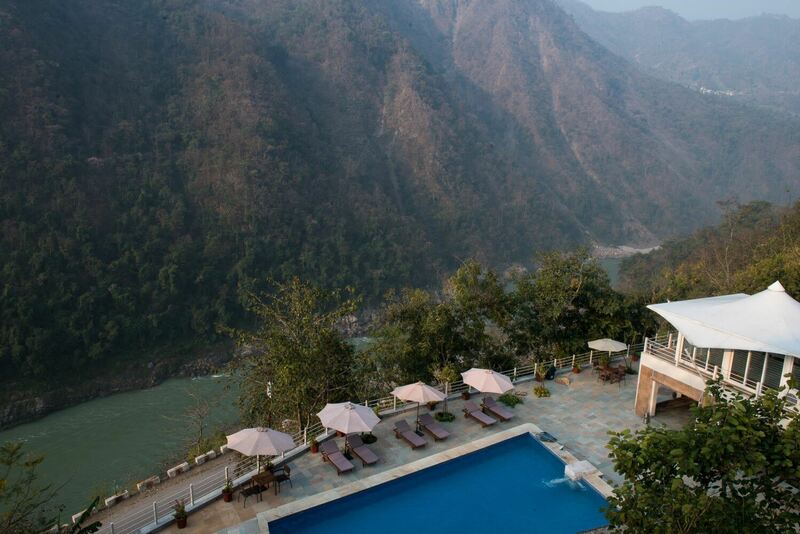 Atali Ganga, located along the scenic Badrinath Road in Rishikesh, proves to be a dream for adventure-loving couples. This grand property calls itself an ‘activotel’, owing to the array of interesting outdoor activities that it offers! The cosy wooden cottages, decked with stone walls and equipped with roomy private balconies, offer the perfect setting for a romantic rendezvous, amidst the gorgeous landscape! Café White Water, their in-house eatery, offers an outdoor deck with a spellbinding view of the misty, verdant landscape! The rooftop pool, overlooking the mighty Himalayas and the gushing Ganges, is apt for a secluded sojourn with a loved one! Book Now! The laid-back, serene vista of Lansdowne is just over a 6-hour drive away from Delhi. Known for natural attractions such as Bhulla Lake, this subtly beautiful place offers a lazy weekend getaway! 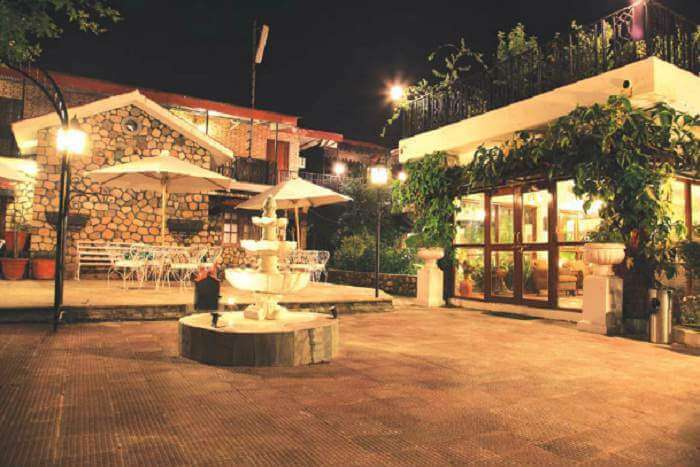 Vanvasa Resort, located about 60 kilometres away from the main town of Lansdowne, provides a cosy cluster of cottages and villas, amidst a tranquil setting. The sparsely decorated interiors exude a homely feel! Adventure-loving couples can opt for a thrilling jungle safari to the Kalagarh Tiger Reserve or the Sonanadi Wildlife Sanctuary! A quick dip in the pristine pool, overlooking the pine-clad hills, and a sumptuous meal at the in-house restaurant, amidst a natural setting, will further enrich their stay! The experience of relishing both the sunrise and the sunset from this resort enhances its uniqueness! Book Now! A long drive of over 6 hours from Delhi will lead to the beautiful town of Nainital, well-known for the mango-shaped Naini Lake and its proximity to other secluded romantic retreats such as Bhimtal and Ramgarh. This jewel of the Kumaon region of Uttarakhand attracts young honeymooners, with its wide array of romantic activities, such as boating and the option of exploring the town, through the aerial route, by cable cars! 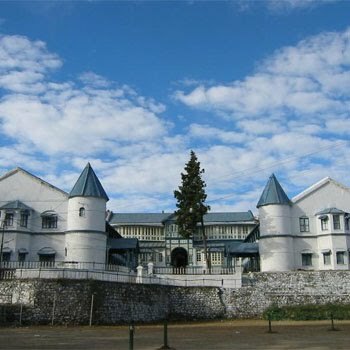 The Naini Retreat, the former residence of the Maharaja of Pilibhit, is a grand heritage hotel, nestled amidst this serene hill station! The timber floors, the antique furniture, the chandeliers and the elegant paintings contribute to its old-world charm and ooze vintage romance! Couples can dine amidst a romantic open-air setting at their Garden Café 'n' Jim's Grill, gorge on multi-cuisine treats at Gurney House or relish fine cocktails at Stella Bar! An aesthetic session of aromatherapy or a refreshing Balinese massage at the in-house spa will add some luxury rejuvenation to their romantic itinerary! Apt for a classic weekend getaway, sprinkled with some cosy moments with a loved one! Book Now! The very mention of Jaipur conjures up images of ancient forts and majestic architecture. However, this green resort, located about 42 kilometres away from Jaipur, along the Delhi–Jaipur highway, is a hidden gem, not many are aware of! Almost a 5-hour drive away from Delhi, this eco-friendly hotel provides ‘nests’, perched atop trees, overlooking the verdant surroundings that mimic tropical forests! The cosy AC tree-top cottages, with trees branching through them, offer an ideal setting for some green-bathed romance in the wilderness! Adventure-loving couples can relish waking up to the cacophony of birds, amidst the lush, all-enveloping ambience! The resort provides an array of culinary treats at Machan—their intricately decked in-house tree-top restaurant, and choicest drinks at the The Peacock Bar—the bar with its elaborate 400-year-old antique wooden interiors, transported from an ancient structure! The resort houses an adorable little pool and Taruveda—an Ayurvedic aviary spa that offers refreshing body treatments amidst the tweets and chirps of birds! An array of interesting activities, such as archery, camel rides and jungle safaris, are available for those who wish their secluded stay to be garnished with some adventure! A rejuvenating escape for stressed Delhiites! Book Now! Parwanoo, once an unheard-of idyllic town, is slowly turning into a well-known romantic retreat! This cosy hill station, located in Himachal Pradesh, along the Chandigarh–Shimla highway, is roughly a 5-hour drive away from Delhi! Nestled amidst the scenic vista of the Shivalik Range, Parwanoo provides a serene getaway from the claustrophobic life of Delhi! The Moksha Himalaya Spa Resort, located near Banasar village in Parwanoo, provides ample opportunity for weary professionals to explore the tranquillity of this gorgeous location! A short cable car ride transfers guests to this majestic resort, while golf carts ensure hassle-free movements within the hotel compound! A therapeutic dip in the alluring rooftop pool, overlooking a gorgeous sunset and the panoramic view of the sleepy town, will soothe overworked souls! Guests can savour scrumptious Oriental, Thai or Continental delicacies at the in-house restaurant that extends to an outdoor seating area! The private terrace areas in their subtly decked suites are apt for spending some cosy moments with a loved one, while relishing the breathtaking view of the pine-clad hills! A splendid sojourn, surrounded by a stunning locale! The long 11-hour journey from Delhi seems justified once the gorgeous trekking paradise, Kasol, reveals itself in all its splendour! This breathtakingly beautiful town, located amidst the pristine banks of the Parvati River, is known for its Israeli cafés and other nearby hippie hubs, such as Tosh! The Himalayan Village is a pet-friendly, cottage-style resort with two ‘machan-style’ rooms, adorning the road that leads to Kasol! 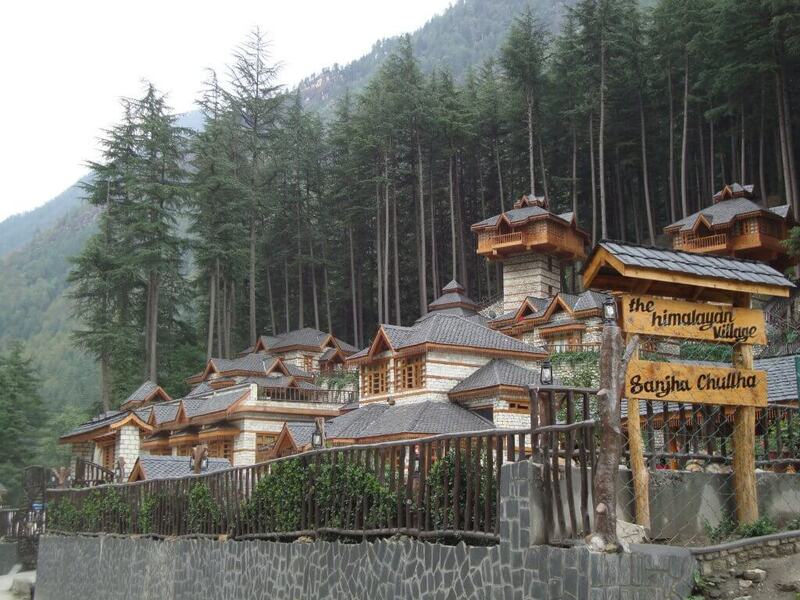 The resort stuns travellers with its traditional wood-and-stone architecture! Enveloped by pines and deodars, this cosy nook offers the perfect ambience for a romantic weekend, amidst the chirps of birds and the therapeutic sound of the gushing Parvati! The plush rooms, the teakwood furniture, the beautiful woodwork, the private sit-outs and the silk curtains contribute to the grand ambience of this luxury resort! Couples can garnish their stay with a quick sauna at the in-house spa, an evening by the bonfire or an entertaining folk performance! There is ample variety for foodies at their in-house restaurant with an open-air ambience! An aesthetically appealing getaway, apt for nature-loving couples! Book Now!